All transactions are safe and secure with a reliable history in online purchasing behind each of our associates. 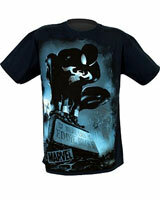 Buy the Spider-Man Venom t-shirt to own Spider-Man clothing and merchandise. This unique piece of Spider-Man clothing displays Spidey sitting atop Venom's grave (or sepulcher). On the front of the tombstone is the name Eddie Brock, Venom's true identity. Peter feels guilty after the horrid looking beast with a snake-like tongue and an appetite for human flesh dies of an illness. Let's just hope the beast doesn't return hungry for Spidey's girlfriend Mary Jane Watson, or his kind Aunt May. Wear this Spider-Man Venom t-shirt underneath a comfortable Spidey hoodie. In addition to the Spider-Man Venom tee above, browse the Spider-Man Clothing Gallery for more apparel like men's and women's clothes, kids shirts or hoodies.